July 5, 2015 – UK. – Britain’s Prince George peeks into the carriage holding his sister, Princess Charlotte, after her christening in Norfolk, England. 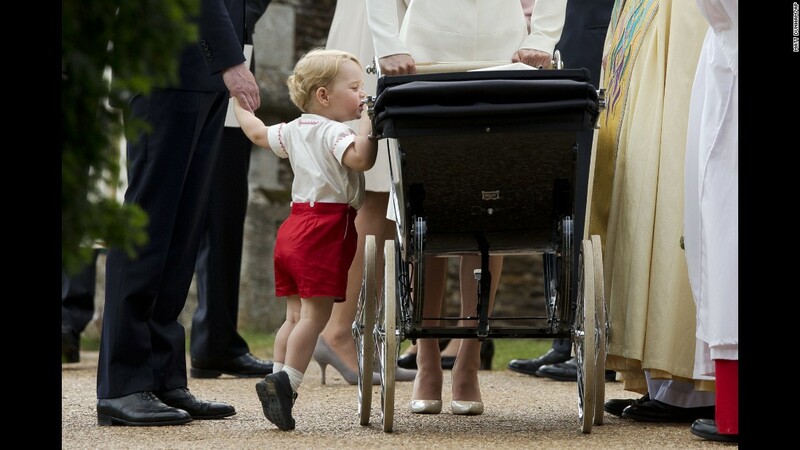 July 5, 2015 – Britain’s Prince George peeks into the carriage holding his sister, Princess Charlotte, after her christening in Norfolk, England. July 10, 2015 – U.S. – A bear falls from a tree after being hit with a tranquilizer dart by wildlife officers in Boulder, Colorado. 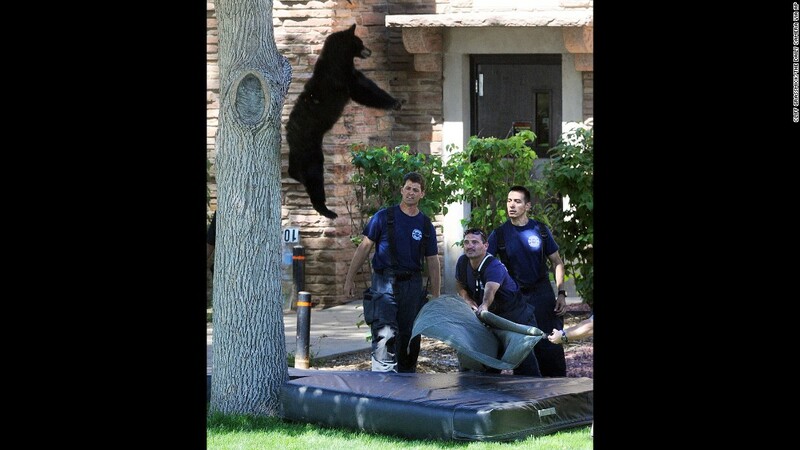 The bear didn’t appear to be injured in the fall, rangers told the Boulder Daily Camera. He had to be relocated because he was in the middle of campus at the University of Colorado. 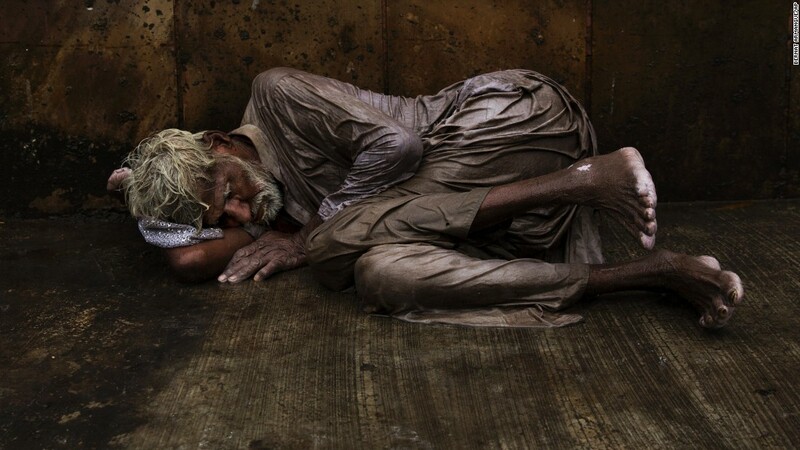 July 10, 2015 in Boulder, Colorado, U.S.
July 11, 2015 – India – A homeless man tries to sleep on a wet street during monsoon rains in New Delhi. Tens of thousands of impoverished people live on the streets of New Delhi, where they struggle with constant hunger and extreme weather while sleeping next to busy intersections and roads. Many come from countryside villages in hopes of finding better economic opportunities. 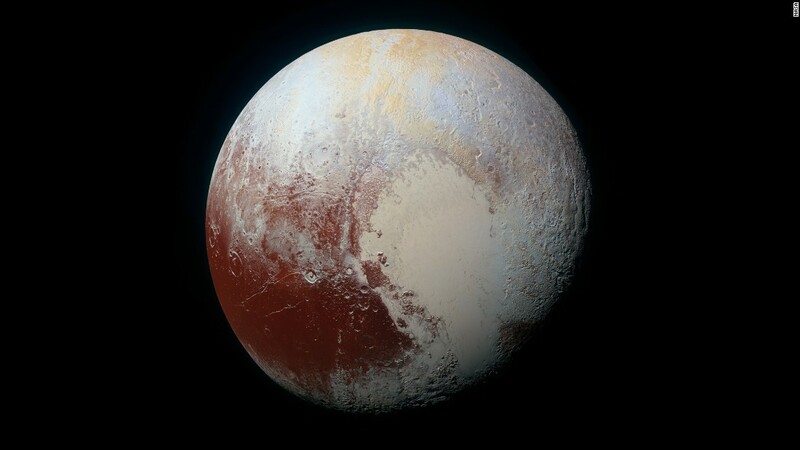 July 14, 2015 – – NASA’s New Horizons spacecraft captured this enhanced-color view of Pluto before flying by the icy world and its moons. The mission completed what NASA calls the reconnaissance of the classical solar system, and it made the United States the first nation to send a space probe to every planet from Mercury to Pluto. 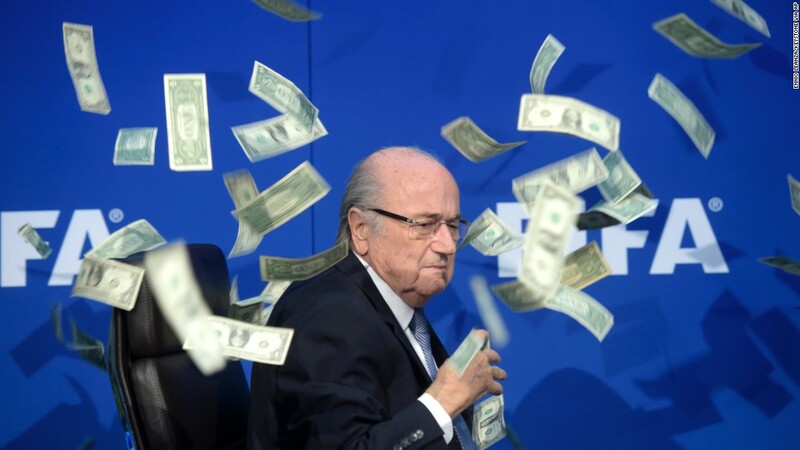 July 14, 2015 – NASA, U.S.
July 20, 2015 – Switzerland – FIFA President Sepp Blatter is showered by dollar bills during a news conference in Zurich, Switzerland. The money was thrown at Blatter by British comedian Simon Brodkin, who was then ushered away from the stage. Blatter has led soccer’s governing body since 1998, but he decided to stand down as FIFA battles corruption scandals. July 20, 2015 – Japan – A beluga whale sprays water toward young visitors at Hakkeijima Sea Paradise, an amusement park in Yokohama, Japan. 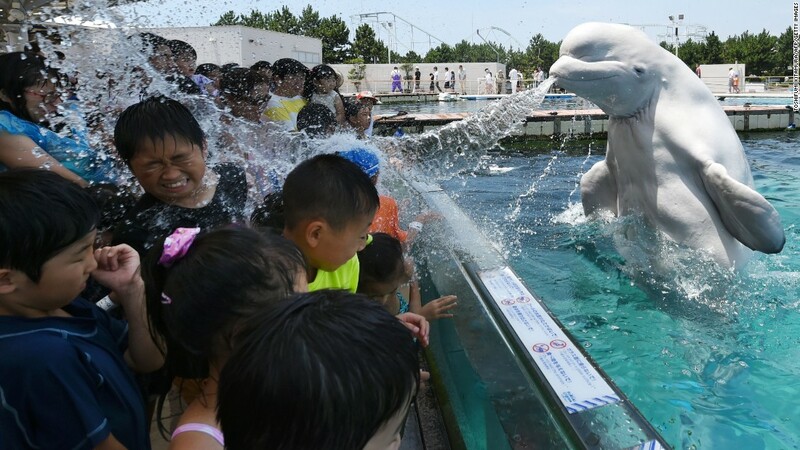 A beluga whale sprays water toward young visitors at Hakkeijima Sea Paradise, an amusement park in Yokohama, Japan. 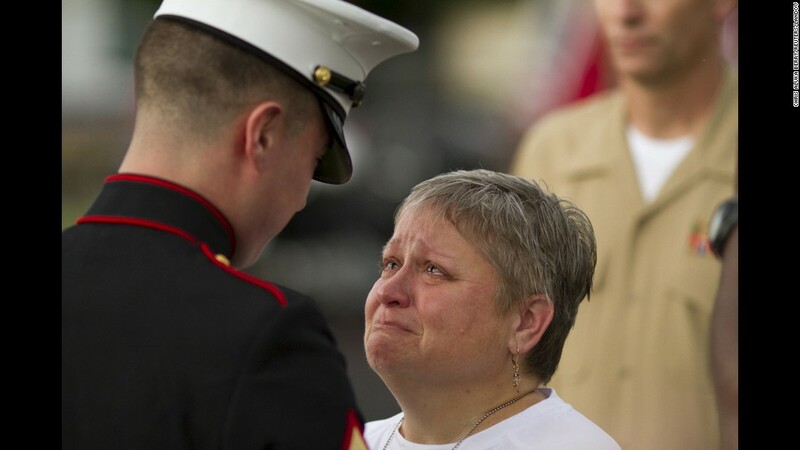 July 21, 2015 – U.S. – Cathy Wells, mother of Lance Cpl. Squire K. “Skip” Wells, is given flowers by a U.S. Marine at her son’s vigil in Marietta, Georgia. Wells, a 21-year-old reservist, was one of five service members killed during a shooting at a Navy reserve center in Chattanooga, Tennessee. The shooter, Mohammad Abdulazeez, died in a gunfight with law enforcement. He had also shot up a military recruiting center before driving to the reserve center. 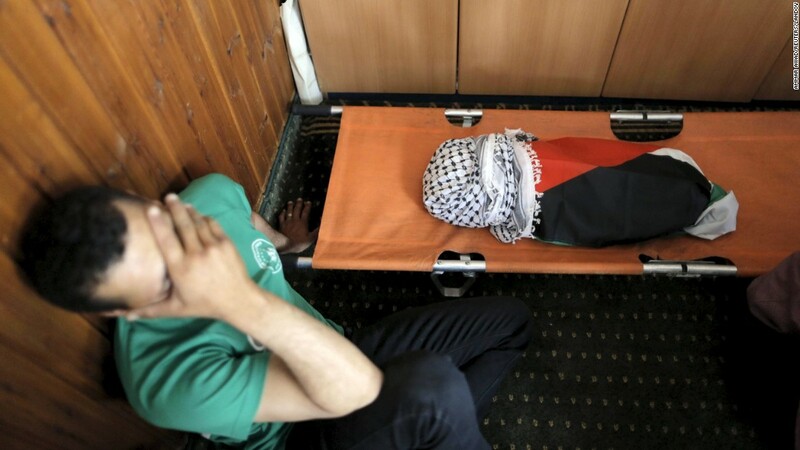 July 31, 2015 – Palestine – A mourner reacts next to the body of Ali Saad Dawabsha, an 18-month-old Palestinian who was killed after his family’s house in Duma, West Bank, was set on fire by suspected Jewish extremists. Authorities found the words “price tag” on the walls of the house, said Luba Samri, a spokeswoman for Israeli police. A “price tag” attack is a term used by radical Israeli settlers to denote reprisal against Palestinians in response to moves by the Israeli government to evacuate illegal West Bank outposts, according to officials. Both Israelis and Palestinians described it as a terrorist attack, but the latter said it blamed Israel. Israeli Prime Minister Benjamin Netanyahu said he was “shocked over this reprehensible and horrific” attack. 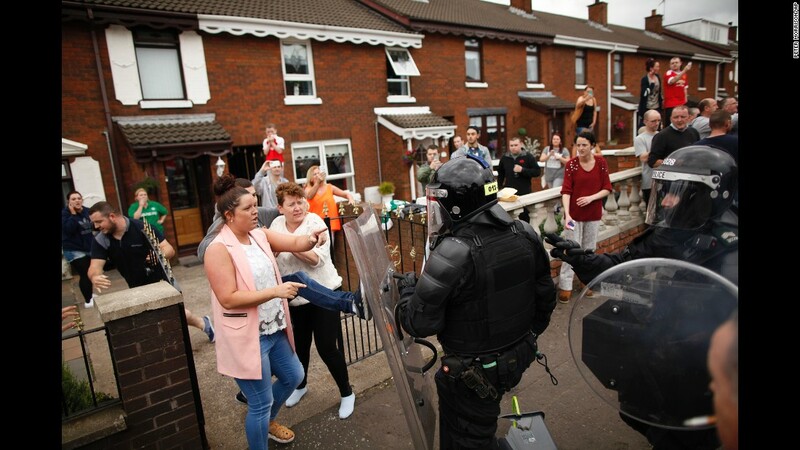 August 9, 2015 – Northern Ireland – Riot police clear the streets in the Oldpark area of Belfast, Northern Ireland, after a controversial anti-internment rally was stopped by police. August 9, 2015 – – A protester shouts at police in Ferguson, Missouri, during a rally held on the anniversary of Michael Brown’s death. Brown’s killing last year sparked outrage and protests against what some described as racial bias by the police. A grand jury didn’t indict Officer Darren Wilson, and the U.S. Justice Department also declined to bring criminal charges, but the feds did issue a report that found the Ferguson Police Department and the city’s municipal court had engaged in a “pattern and practice” of discrimination against African-Americans, targeting them disproportionately for traffic stops, use of force and jail sentences. 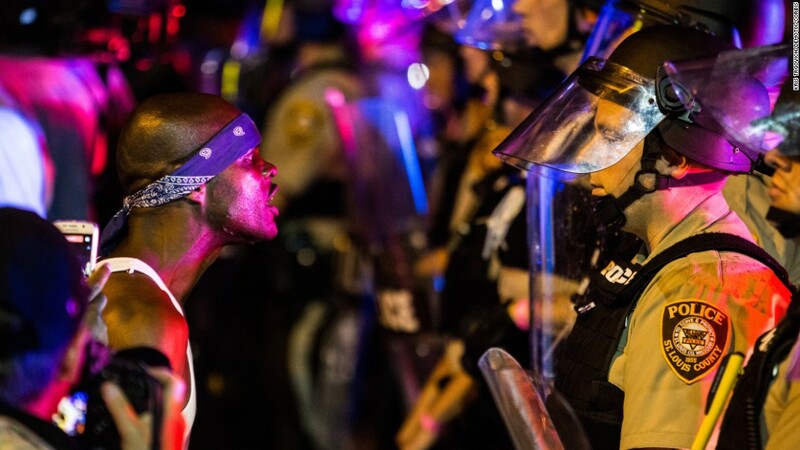 August 9, 2015 – A protester shouts at police in Ferguson, Missouri, during a rally held on the anniversary of Michael Brown’s death. 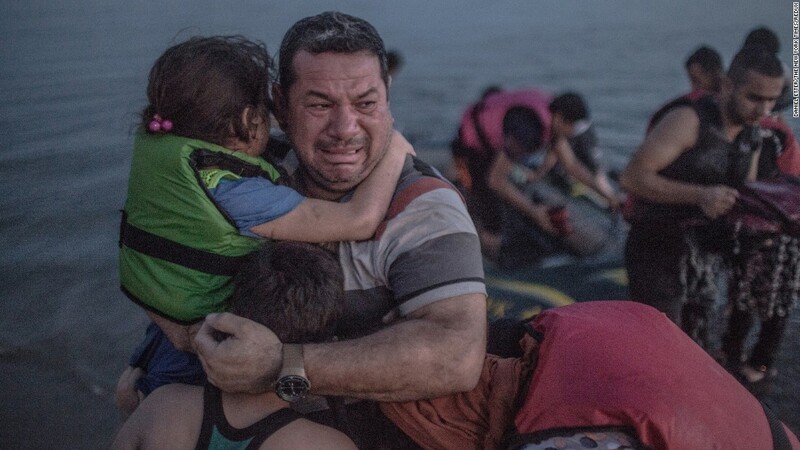 August 15, 2015 – Greek Island – A refugee, holding his son and daughter, cries tears of joy after their boat arrived on the Greek island of Kos. The island in the Aegean Sea has been overwhelmed by refugees. August 15, 2015 – Nepal – Protesters hit a police officer with a torch during a rally in Kathmandu, Nepal. There were violent clashes over the country’s proposals for a new constitution, and some police officers were killed or injured. The officer in this photo was injured, according to the photographer, but he survived. August 15, 2015. 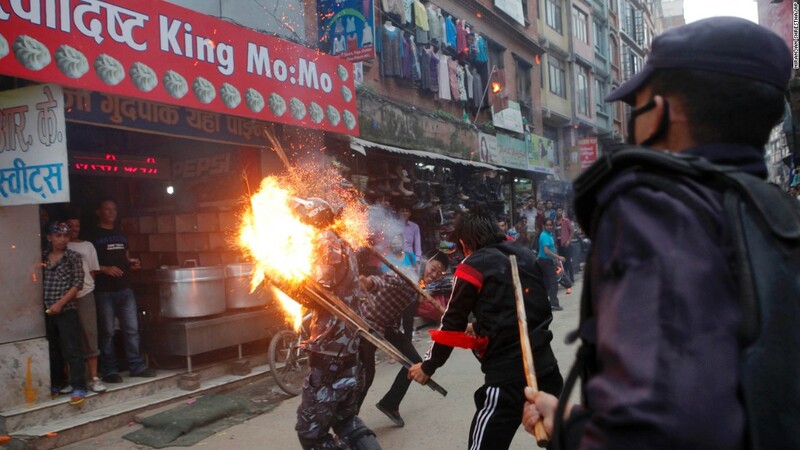 Protesters hit a police officer with a torch during a rally in Kathmandu, Nepal. 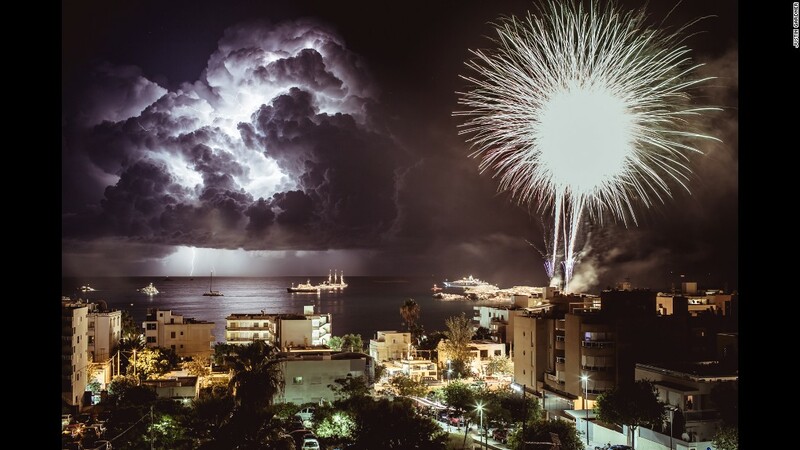 August 16, 2015 – Spain – Fireworks explode in Figueretas, Spain, as lightning flashes over the sea. August 16, 2015. Fireworks explode in Figueretas, Spain, as lightning flashes over the sea.